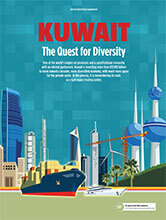 eninsula Press sits down with a striking new generation of Kuwaiti leaders to discuss their views on the country’s development, the role it plays in the region, and how they are helping transform Kuwait into a global business, financial and service hub. Al-Riyada Finance & Investment CO. K.S.C. Ali Abdulwahab Al-Mutawa Commercial Co.
© 2019 Kuwait Interview Series.